January 12-22, 2012 marks the third annual South Carolina Restaurant Week. Mr. T and I decided to take advantage of the deal last night by going to one of our favorites, Nose Dive. Most restaurants offer a $30 deal that includes your choice of an appetizer, entree, and dessert, but Nose Dive's menu is quite different from that. They offer a list of food items and a list of beverages that are paired with those food items. Each pairing is $10, and you just get as many as you like. Mr. T and I were all over this deal, especially because their food selections were some of our favorite regular menu items. We started with the Poutine, Nose Dive's take on the Canadian version of french fries. The dish consisted of thick-cut braised potatoes cooked in duck fat topped with a duck gravy and cheese curds. Once our server described the dish in detail, Mr. T claimed "I would eat my foot if it were battered and fried in duck fat", so naturally with that conviction we ordered it. The pairings we chose for this were the Al Verdi Pinot Grigio and Westbrook IPA. 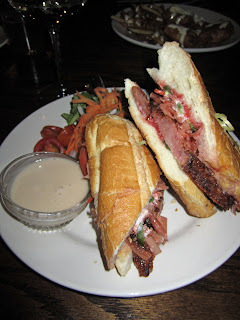 For our main course I had the Vietnamese Banh Mi (not on the Restaurant Week Menu). This light, sweet, and crisp sandwich is served on a French roll with chari siu pork, pickled vegetables, cilantro, and thinly sliced jalapenos that add just the right amount of heat. Mr. T had the Fish and Chips. The dish was served with Cole Slaw and topped with a Malt Vinegar Aioli. The fish was flaky, buttery, and SO good. It's even offered in a gluten free version for anyone with a gluten allergy. After our entrees we were full, but of course I didn't stop there. I wanted to get another glass of wine so getting a dessert to pair it with for only $4 more was a no brainer. We ordered the Dark Chocolate Candied Bacon Brownie, and it was amazing. The warm brownie was topped with a house-made American Honey Bourbon Ice Cream that was equally phenomenal. So we got all of this with wine and beer pairings for about $40, pretty good right? I hope y'all have taken advantage of SC Restaurant Week deals, too! It's a great way to support local restaurants in their slowest season, and a fabulous deal too!